The Pact of Steel (German: Stahlpakt, Italian: Patto d'Acciaio), known formally as the Pact of Friendship and Alliance between Germany and Italy, was a military and political alliance between Italy and Germany. The pact was initially drafted as a tripartite military alliance between Japan, Italy and Germany. While Japan wanted the focus of the pact to be aimed at the Soviet Union, Italy and Germany wanted it aimed at the British Empire and France. Due to this disagreement, the pact was signed without Japan and became an agreement between Fascist Italy and Nazi Germany, signed on 22 May 1939 by foreign ministers Galeazzo Ciano of Italy and Joachim von Ribbentrop of Germany. The pact consisted of two parts. The first section was an open declaration of continuing trust and cooperation between Germany and Italy while the second, a "Secret Supplementary Protocol", encouraged a union of policies concerning the military and economy. Although intended to last 10 years, it was effectively cancelled in 1943 with the removal of Italy's fascist government. Germany and Italy fought against each other in World War I. Popularity and support for extremist political parties, such as the Nazis of Adolf Hitler and the Fascists of Benito Mussolini, exploded after the Great Depression severely hampered the economy of both countries. In 1922, Mussolini secured his position as Prime Minister of the Kingdom of Italy. His first actions made him immensely popular - massive programs of public works provided employment and transformed Italy's infrastructure. In the Mediterranean Mussolini launched a powerful navy, larger than the combined might of the British and French Mediterranean fleets. When he was appointed Chancellor in 1933, Hitler initiated a huge wave of public works and secret rearmament. Fascism and Nazism shared similar principles and Hitler and Mussolini met on several state and private occasions in the 1930s. In 1931, Japanese forces invaded the region of Manchuria because of its rich grain fields and reserves of raw minerals. This, however, provoked a diplomatic clash with the Soviet Union, which bordered Manchuria. To combat this Soviet threat, the Japanese signed a Pact with Germany in 1936. The aim of the pact was to guard against any attack from Soviet Russia were it to move on China. Japan elected to focus on anti-Soviet alliances instead of anti-Western alliances like Italy and Germany. Germany, however, feared that an anti-USSR alliance would create the possibility of a two-front war before they could conquer Western Europe. So when Japan was invited to sign the Pact of Steel, they declined. Officially, the Pact of Steel obliged Germany and Italy to aid the other country militarily, economically or otherwise in the event of war, and to collaborate in wartime production. The Pact aimed to ensure that neither country was able to make peace without the agreement of the other. The agreement was based on the assumption that a war would not occur within three years. When Germany invaded Poland on 1 September 1939 and war broke out on 3 September, Italy was not yet prepared for conflict and had difficulty meeting its obligations. Consequently, Italy did not enter World War II until June 1940, with a delayed invasion of Southern France. The Contracting Parties will remain in permanent contact with each other in order to come to an understanding of all common interests or the European situation as a whole. If it should happen, against the wishes and hopes of the Contracting Parties, that one of them becomes involved in military complications with another power or other Powers, the other Contracting Party will immediately step to its side as an ally and will support it with all its military might on land, at sea and in the air. In order to ensure, in any given case, the rapid implementation of the alliance obligations of Article III, the Governments of the two Contracting Parties will further intensify their cooperation in the military sphere and the sphere of war economy. Similarly the two Governments will keep each other regularly informed of other measures necessary for the practical implementation of this Pact. The two Governments will create standing commissions, under the direction of the Foreign Ministers, for the purposes indicated in Article I and II. This Pact comes into force immediately upon its signing. The two Contracting Parties are agreed upon fixing the first period of its validity at 10 years. In good time before the elapse of this period they will come to an agreement regarding the extension of the validity of the Pact. The secret supplementary protocols of the Pact of Steel, which were split into two sections, were not made public at the time of the signing of the Pact. The first section urged the countries to quicken their joint military and economic cooperation whilst the second section committed the two countries to cooperate in "matters of press, the news service and the propaganda" to promote the power and image of the Rome-Berlin Axis. To aid in this, each country was to assign "one or several specialists" of their country in the capital city of the other for close liaisons with the Foreign Minister of that country. After being told the original name, "Pact of Blood", would likely be poorly received in Italy, Mussolini proposed the name "Pact of Steel", which was ultimately chosen. According to Article VII, the pact was to last 10 years, but this did not happen. In November 1942, the Axis forces in North Africa, led by Field Marshal Erwin Rommel, were decisively defeated by the British and British Commonwealth forces at the Second Battle of El Alamein. In July 1943 the Western Allies opened up a new front by invading Sicily. In the aftermath of this, Mussolini was overthrown by 19 members of the Gran Consiglio who voted in favour of the Ordine Grandi. The new Italian government, under Field Marshal Pietro Badoglio, signed an armistice with the Allies in September and became a non-belligerent, thus effectively ending Italy's involvement in the pact. Although a puppet government under Mussolini, the Italian Social Republic, was established in Northern Italy by Nazi Germany, Italy continued as a member of the pact in name only. ^ a b c d e f g World Media Rights 2009. ^ Knight 2013, p. 22. ^ Knight 2013, pp. 68–69. ^ Shirer 1960, pp. 258–262. ^ Corvaja 2013, p. 13. ^ a b c Maltarich 2005, p. 75. ^ Hiden 2014, pp. 187–188. ^ a b c d e f g h i j Office of Counsel 2015. ^ Belco 2010, p. 37. ^ Knox 2002, p. 181. ^ a b c Historical Resources 2015. ^ Nicholls 2000, p. 195. ^ a b c d World Media Rights 2009a. Belco, Victoria (2010). War, Massacre, and Recovery in Central Italy, 1943–1948. University of Toronto. ISBN 978-0-8020-9314-1. Corvaja, Santi (2013). Hitler & Mussolini: The Secret Meetings. Enigma Books. ISBN 978-0982491164. Hiden, John (2014). Germany and Europe 1919–1939. Routledge Publishing. ISBN 978-1-317-89627-2. Knight, Patricia (2013). Mussolini and Fascism. Routledge. ISBN 978-1136477508. Knox, MacGregor (2002). Hitler's Italian Allies: Royal Armed Forces, Fascist Regime, and the War of 1940–1943. Cambridge University. ISBN 978-1-139-43203-0. Maltarich, William (2005). Samurai and Supermen: National Socialist Views of Japan. Peter Lang Publishing. ISBN 978-3-03-910303-4. Nicholls, David (2000). Adolf Hitler: A Biographical Companion. ABC-CLIO. ISBN 978-0-87436-965-6. Shirer, William (1960). The Rise and Fall of the Third Reich. Simon & Schuster. ISBN 978-0-671-62420-0. "The Italo-German Alliance, May 22, 1939". United States Office of Counsel for Prosecution of Axis Criminality. Retrieved 12 March 2015. 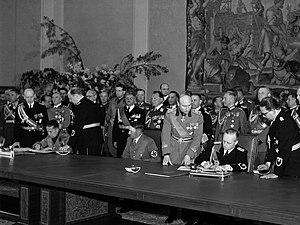 "The Pact of Steel – the Pact of Friendship and Alliance between Germany and Italy, May 24, 1941". Historical Resources. Retrieved 12 March 2015. The Mediterranean And North Africa (television documentary). United States: World Media Rights. 2009. Retrieved 12 March 2015. The Road To War (television documentary). United States: World Media Rights. 2009. Archived from the original on 28 February 2015. Retrieved 12 March 2015.